New Hamburg Full Throttle is back for 2015! My riding buddies and I are putting on the New Hamburg Full Throttle motorcycle charity ride again in 2015. The date is set for Saturday June 13. New Hamburg is in Ontario between Kitchener Waterloo and Stratford along highway 7&8 (10 mins from KW). All money raised this year will be donated to the Wilmot Township Volunteer Fire Department. They will also be in attendance at the event with at least one truck on display. This year we are moving away from the Fairgrounds and holding the event at the Waterloo Arms British Pub at 338 Waterloo St. New Hamburg... which has a paved parking lot instead of the gravel track at the fairgrounds. $500 will be going to the top finisher in the poker run again this year for those that wish to participate. The poker run is a little shorter this year clocking in at about 100kms so it won't take as long as the last couple years. There will be plenty of other prizes as well. 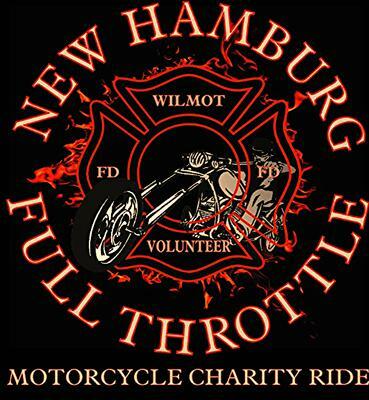 Registration is $40 and that gets you a 2015 NHFT t-shirt of the size you wish, a BBQ meal ticket at the Waterloo Arms and entry into the poker run. For those bringing passengers more t-shirts will be on sale at the event. We are also offering mechanics shirts for sale as well for 2015 and they look slick. We are open to any and all types of rides and people who enjoy riding. I hope to see you there!